Last year James Boo of The Eaten Path arranged a blogger meet up at East Harbor, but I wasn't able to make it. I've since visited several times and it's quickly become among my favorite places for dim sum. 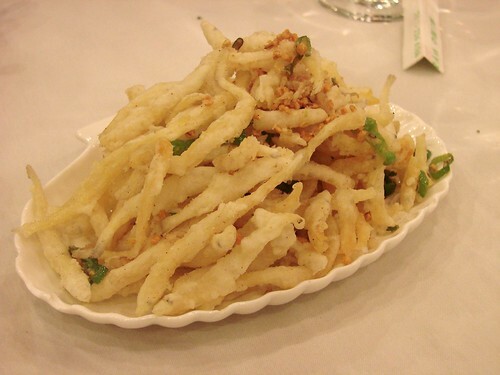 Thanks to Robyn I was able to order one of their specialties like a pro: Bak Fan Yu, aka deep fried whitebait, seen above. Perfectly crispy, these are like little crunchy fishy chips. Super addictive. And not necessarily in the regular rotation of stuff that makes the round to all the tables--not sure if that's because they are so popular or what, but if you are able to snag the waiter's ear, be sure early on to ask that they bring by the bak fan yu tray, you won't be sorry. For dessert, you can't miss the Candied Peanut Dusted Black Sesame filled Mochi. Where to begin? 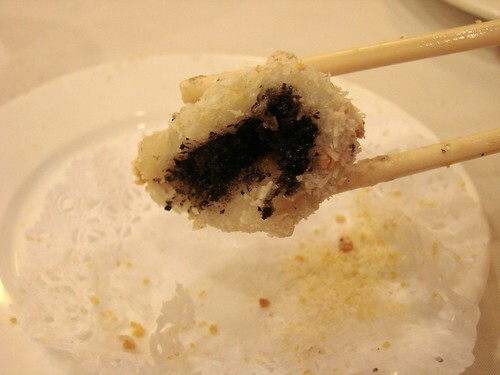 Pleasantly chewy and sweet mochi covered with crunchy bits of peanuts and filled with rich black sesame paste. If you like any or all of those components, I seriously would recommend paying East Harbor a visit for this alone. Any one know where I can get these (or a similar dessert) in Chinatown? 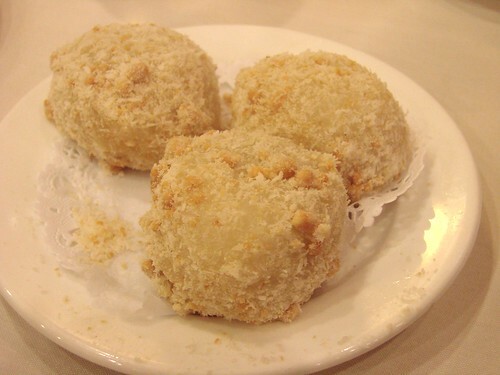 A-Wah at 5 Catherine street has the black sesame-filled rice ball with peanuts dessert. They were pretty darn tasty. @Bandit: really? that's awesome! Thanks for the tip. I'll definitely check it out!